The Ivanti Patch and the Published Third-Party Updates grids each consist of two panes. Each pane displays unique information and provides unique functionality. •The top pane displays all of the updates for the selected list item. This pane contains a large number of columns that provide high level information about each update. You can also select the updates that you want to perform an action on. •The bottom pane displays detailed information about the update that is selected in the top pane. This pane is not available if more than one update is selected in the top pane. •Apply filters to search for specific updates. •Reorder the columns by clicking and dragging the column headers to new locations. Only the Selected column cannot be moved. •Click within a column header to sort the column in ascending or descending order. •Right-click within a column header to resize the columns and choose which grid lines to show. You can also choose which columns to display within the grid. The Ivanti Patch grid contains a number of unique columns that help you identify the status of each update. 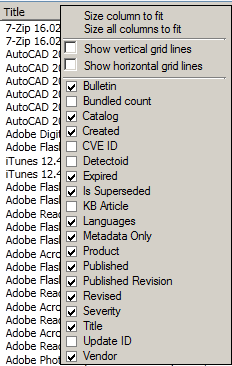 •Bundled count: Indicates the number of updates contained within a bundle. The value will be blank if you select an update that is not part of a bundle. •Catalog: Indicates which catalog the update is contained in. •Detectoid: Indicates if the selected item is a detectoid. A detectoid is a piece of logic that determines if an update is installable. •Published: Indicates if the update has been published to WSUS. •Published Revision: This number is incremented each time a revision to that update is published. All published updates will have a number greater than zero. •Revised: Indicates if the update is a revision to an update that was previously published. If so, the check box in the Selected column will be enabled. Publishing such an update will create a new revision and will increment the Published Revision number. •Languages: Identifies the different language versions that are available for each update. You can limit which languages are displayed by using the Languages tab of the Ivanti Patch for SCCMSettings dialog. If the Languages column entry is blank it means that the update applies to all languages that the product supports. 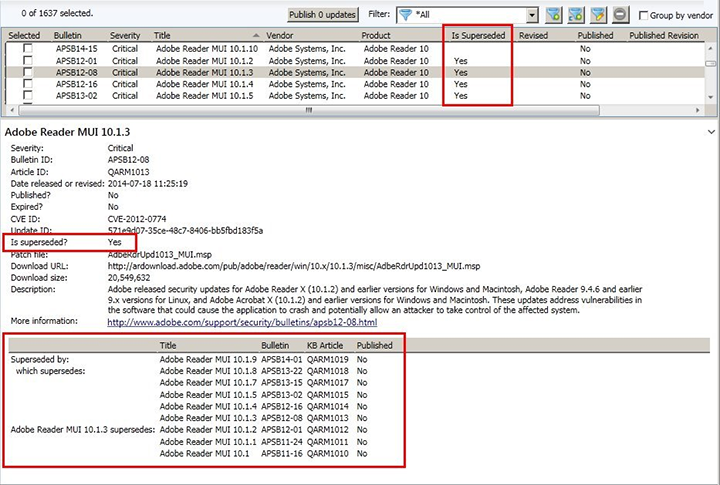 •Metadata Only: Indicates if detection logic has been published for the update but not the actual software binaries used to install the update. •Is Superseded: Indicates if the update has been superseded by another update. An update that has been superseded is not the most current update available. To view the supersedence chain for an update, select the update and the superseded information is displayed in the bottom pane. The default filter, *Latest not-published, will not display any superseded updates that have not already been published. To view all updates, including superseded updates, select the filter named *All.